His size and athleticism have drawn comparisons to players such as Julius Peppers and Mario Williams. I, on the other hand, see a flash of Von Miller in Garrett. Miller and Garrett, both former Texas A&M pass rushers, aren’t comparable because of their body type or playing style. And I am certainly not projecting that Garrett will be as impactful in the NFL as Miller has been. But, like Miller, he could be as impactful on the NFL, even before he plays in the league. Miller purposefully took action that he knew would upset the NFL, saying, “I hope it wouldn’t hurt my draft stock. But you can’t really get possessive over something you never had. So if I fall, then that’s the way it will be. I’ll still be signed with someone and playing football in the NFL.” Miller was the second player taken, after Cam Newton, so I think it is safe to say his talent was stronger than any negative opinions formed about him. The decision Garrett is making does not carry with it the nobility or risk that Miller’s did. But the impact on the league could be more significant. At the combine, Garrett said he didn’t want to attend the draft in Philadelphia. When his name is called, he wants to be in Texas, around all the important people in his life. It’s a fairly benign gesture that, though not common, isn’t unprecedented. In 2015, Jameis Winston was the last No. 1 draft pick to skip the NFL draft festivities. Having the biggest star of the night absent is obviously not ideal for ESPN, which paid the NFL for the right to air the draft. 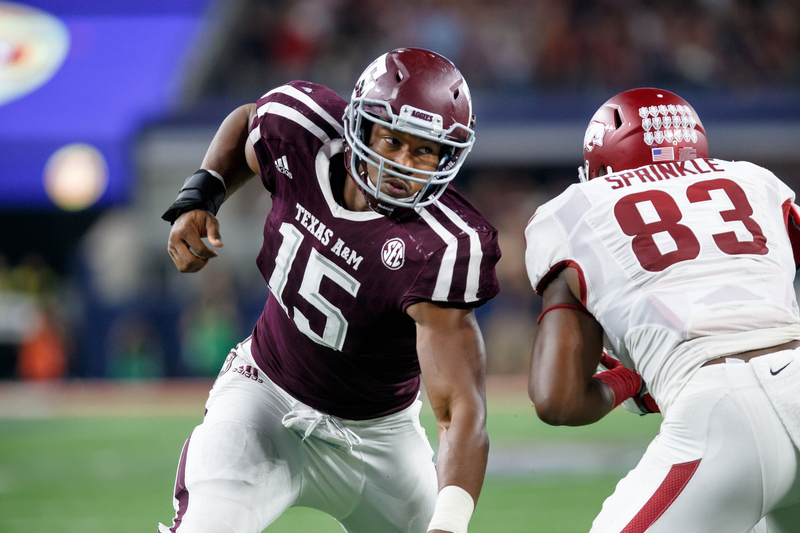 Texas A&M Aggies defensive end Myles Garrett (No. 15) works around Arkansas Razorbacks tight end Jeremy Sprinkle (No. 83) during their Southwest Classic college football game Sept. 24, 2016, at AT&T Stadium in Dallas. Acknowledging that part of the draft’s intrigue is players’ reactions to having a lifelong dream fulfilled or deferred, ESPN did a live “look-in” to Winston’s celebration in Alabama. It won’t be that simple this year. Access to Garrett’s tearful celebration after being selected first, or his thinly veiled disappointment after being passed over, isn’t the NFL’s to grant. Instead, Athlete Content & Entertainment Media (ACE Media), a venture launched by the NFL Players Association (NFLPA) in 2015, will be there producing the content related to Garrett on draft night. In partnership with Sports Illustrated, ACE Media will be livestreaming Garrett’s evening from Texas. To get access to Garrett on draft night, ESPN will have “live hits” with ACE Media and the NFLPA. The NFL can’t be happy that the human element, the reality TV-esque drama that could attract more viewers, isn’t theirs to control and monetize. The control, access and compensation belong to Garrett and ACE Media, so I guess the absence of the obligatory dap and hug between the No. 1 pick and the commissioner is more symbolic than ever. While Garrett isn’t skipping the draft for reasons of power, leverage or control, I do think this ACE Media-backed venture exposes an opportunity for future top picks, should they be so inclined. Currently, draftees are not compensated for participating in draft week festivities. It’s an arrangement familiar to these college athletes. But if the top prospects decide, as a group, not to attend, the NFL and its broadcast partner must negotiate for their participation. The way video games work now could be the future of the draft. To make any football-related games or apps, from EA’s Madden series to smartphone apps, developers must negotiate separately with the league for the rights to use NFL logos and with the players for the use of their name and likeness. Obviously, having the rights to both is ideal, but for gaming, the logos are probably more important. But for an engaging TV or streaming draft experience, the players are much more compelling. It is true that ACE Media’s exclusive access to Garrett on draft night puts the NFLPA in conflict with the NFL, a familiar position. But Ahmad Nassar, president of Players Inc., the licensing and merchandising arm of the NFLPA, and chairman of ACE Media, thinks ACE isn’t a competitor to the NFL. Nassar anticipates a future when ACE Media will provide content for the NFL Network. But, according to a 2015 Hollywood Reporter article, ACE Media CEO Scott Langerman isn’t limiting his aspirations to sports partnerships. Langerman sees opportunities for athletes on outlets such as HGTV and the Food Network. That wasn’t just talk. In its brief history, ACE Media has partnered to create content with brands such as ABC Television, Spotify and E! Entertainment Television. Last fall, E!, the network known for Keeping Up with the Kardashians and its many spinoffs, gave us a glimpse into the dating life of Kansas City Chiefs tight end Travis Kelce with Catching Kelce. ACE Media is partly responsible for Kelce meeting Maya Benberry, and many people watched. Shockingly, Benberry and Kelce are no longer together, making way for a potential Season 2. Though ACE Media was launched by Players Inc., it delivers athlete-focused, sports-related lifestyle content across all sports. ACE Media has worked with NBA stars and is now partnering with a prominent text company to create a video series starring stars from the Premier League in England and Major League Baseball. It’s not clear which companies in the future of media will be able to prosper, but ACE Media seems poised for success. That’s because it has something no one else has, not even the NFL: the group licensing rights of all players in the NFL. For decades, Players Inc. used these rights to generate revenue that funds NFLPA operations and goes into the pockets of players, to the tune of more than $145 million in revenue annually, before launching ACE Media. ACE Media venturing outside of sports should generate more than just revenue. Introducing audiences to athletes away from the game will do wonders for the image of the NFL. For people who don’t follow football closely, the things they hear about football are mostly negative. The football news that penetrates their media sphere is related to concussions, domestic violence and murder, so the NFL should welcome the emergence of ACE Media. But the league may fear what it could become and how it could change the dynamics in the relationship between the league and the union. Like all startups, ACE Media aspires to become a multibillion-dollar company with global influence and the respect of industry giants. Yes, it’s a monumental goal that most startups fail to achieve, but ACE Media and the NFLPA can look to Major League Baseball and MLB Advanced Media (MLBAM) for inspiration. The companies provide different services, but MLBAM was started by MLB in 2000 and was valued at $3.6 billion last year when Disney purchased a stake. The NFLPA could be much more formidable in negotiations with the NFL if in 15 years, like MLBAM, regardless of whether games are being played, ACE is bringing in revenue of more than $1 billion annually.